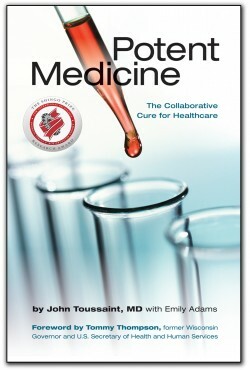 Dr. Toussaint proposes new ideas on how to transform America’s entire healthcare system. Potent Medicine is written for healthcare leaders or anyone who cares about improving the healthcare system in North America. For example, true transparency means plain speaking—using words like death and risk and error. A patient evaluating a hospital for impending heart surgery needs to research a few simple measures of quality. This book provides ideas that can start a thousand journeys across our country to address our healthcare crisis. Through creative collaboration on widespread experiments, we can move slowly from a broken system choking American employers and taxpayers, while failing patients and frustrating providers, to an efficient and safe healthcare system that can be the envy of the world. Physicians, start discussions with your colleagues about payment models and share resources that put the patient at the center. Track your own quality and cost metrics. Patients, ask informed questions of your caregivers, like “based on what evidence?” Take responsibility for your health decisions. Payers, know what you’re paying for, release your data to the public, and design payments to improve healthcare value. Support regional and statewide initiatives for payment systems that reward value. Employers, track the health of employees or members through health risk assessments. Pay for outcomes, not procedures. Policy-makers, enact legislation for reporting health outcomes that allow states to determine specific measures and publicly report them. Encourage private-public initiatives in every region. Overhaul current antitrust laws to allow deep collaboration between hospitals and physicians. Launch public education campaigns for consumers about using health data to compare hospitals and physicians. There is no simple answer to achieving a sustainable, quality health care system in this country. There is, however, a path on which to begin. Potent Medicine highlights those steps. What have been missing in our nation’s debate on healthcare are practical solutions that have been tested in the real world. Based on what he and his collaborators have learned in Wisconsin, Dr. Toussaint proposes new ideas on how to transform America’s entire healthcare system to an efficient and safe system that can be the envy of the world. Dr. John Toussaint is an action-taking revolutionary. As a real leader, not a theorist, he has proven it is possible to vastly improve medical care outcomes while reducing costs. Read about it here. A candid, riveting discussion of the brave work underway in Wisconsin to deliver more efficient and effective healthcare. Healthcare has never needed a lifeline more than it does today. Toussaint’s prescription—increased transparency, reliable application of evidenced-based medicine, and changes to our payment system—is precisely what we need to transform our strained system to the one all patients deserve. With On the Mend, Toussaint delivered the most readily readable book on making lean work in healthcare. Now he addresses a topic as important—how to create an external environment that accelerates the U.S. health system’s uptake of lean and other badly needed trend-bending tools. John’s uncanny sense of what’s practical, wisdom and clarity of thought make his second book as wonderfully engaging as his first. Potent Medicine provides a thoughtful review of the evolution of health care reform efforts in Wisconsin. The reader walks away with both a historical context and a strong appreciation for the difficult cultural transformation that lies ahead. There is one line from the book that sums up the payment reform struggle perfectly. Toussaint relays a discussion with a provider about Medicare requirements pertaining to advance directives, which the physician describes as “another 20-minute conversation I don’t get paid for.” Indeed. Potent Medicine is a clarion call. I couldn’t put it down. I thought I was knowledgeable about the issues involved in healthcare reform, but Potent Medicine is an epiphany. 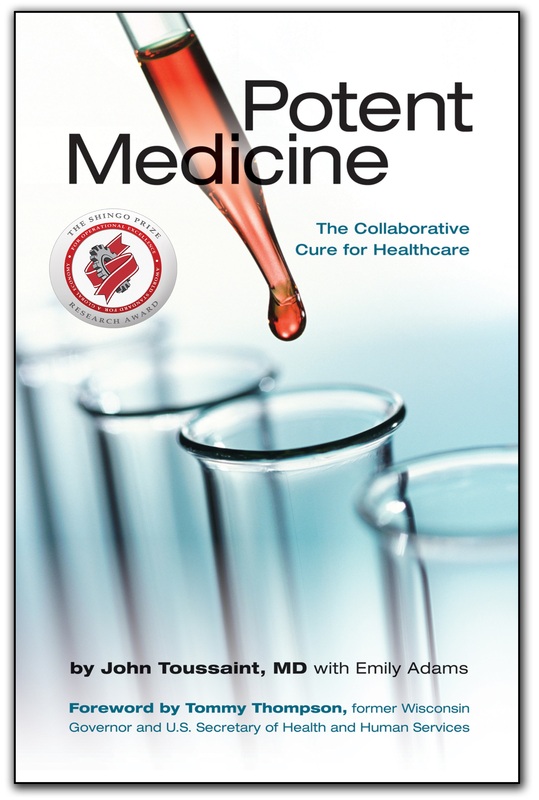 Dr. Toussaint’s first book, On the Mend, was illuminating. Potent Medicine is revolutionary. And it is as pragmatic and moral as it is revolutionary. Dr. Toussaint is one of our country’s leading experts on high quality, less wasteful healthcare, and he continues to put his thinking into effective collaborative action; moving from tremendous local and state level success up to national scale. If you care about where we are headed with healthcare— whether as a patient, provider, insurer, policy maker or activist–this is a must-read! Dr. Toussaint follows up nicely. “Potent Medicine” and “On The Mend” are two must-haves for anyone serious about health care process improvement. I bought the hardcover immediately when its release was announced, and I will also buy the Kindle edition when I get home tonight (more convenient to carry around and easier to grab things to cite on my blog). I found his guardedness over the potential of the nascent ACO model (and large national federal initiative more broadly) quite interesting. Many critics deride ACO as “HMO revisited” (a concern I share). But, a Lean approach to care process delivery coupled with the true “patient centered focus” Dr. Toussaint advocates might make things different this time. Medical economist J.D. Kleinke asserts that the viable future lies in “managing the disease instead of managing the money (i.e., HMOs),” and, paraphrasing Dr. Toussaint (page 142), “the money will be in the margins” (i.e., maximizing the margins by excising waste wherever it is found). Another valuable and timely contribution to the process improvement literature. Dr. Toussaint distills his experience in lmproving health care quality and value at the hospital and state levels for other leaders to use. Public information on the performance of that system from the individual physician to competing organizations is a key element in his potent prescription for reform. Mr. Toussaint explains how improving the quality of health care also lowers its cost, addressing the two major issues facing health care through proven quality improvement techniques. Real-life examples show how hospitals have tackled quality and cost issues with successful strategies focused on patient-centered care. The book should be required reading for all leaders of health care organizations.